The first “wave and pay” system using a credit or debit card will finally be introduced on the Tube within weeks in a move that may lead to Oyster being phased out on the Underground. Transport for London will begin a pilot scheme for 5,000 passengers before Christmas before opening it to the fare-paying public next year. The pilot will involve customers, staff and other groups testing cards before the method is available across London Overground, DLR, Tube and trams. Under the “contactless” travel system, passengers swipe their bank card across the reader at stations and cash is deducted directly from their account. The method, which is already used on London buses, means TfL customers avoid having to convert cash into an Oyster “token” before they can pay and saves on administration costs. In December last year TfL introduced wave and pay on buses — and more than four million bus journeys in London have now been paid for using a contactless debit, credit or charge card. But the average number of passengers doing this per bus per day is less than three. It cost £4.4 million to install contactless readers on London’s 8,500 buses. TfL has an incentive for people to use the method as it keeps more revenue than through Oyster. But the banks also need a major adopter for contactless payment use to take off. The system is not new technology and many UK retailers have been trialling it for at least five years — but consumers have been reluctant to adopt it. Boris Johnson said in May he wants to “move away” from Oyster to wave and pay because he did not want to run “payment systems” in the long term. But TfL later insisted there were no plans to decommission Oyster. It is thought that Oyster will remain for some time, not least because wave and pay is not an option for those without bank accounts. The scheme’s introduction has been delayed by a year as transport chiefs said they did not want to risk teething troubles in the run-up to the Olympics. The technological challenge of installing it on the Tube — working with banks and Redhill-based TfL contractor Cubic — is much greater than on the buses. Caroline Pidgeon, leader of the Lib-Dem London Assembly Group, said: “It is time the Mayor gave some clear answers on how wave and pay technology will finally be rolled out across the Tube, DLR, trams and Overground. Sunday the 27th of October saw the Nocturnal Heart of the Pennines Bus Rally. This was centred on the Piece Hall in Halifax town centre. Buses were lined up on the cobbles and during the day Roger Kaye captured some of the atmosphere, especially later on as dusk turned to night and the vehicles were illuminated both inside and out. 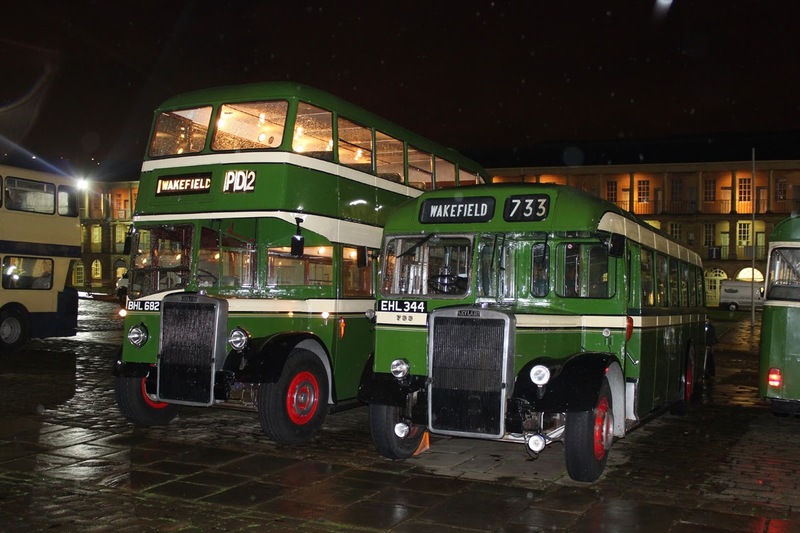 Here a couple of local buses from West Riding stand side by side, the damp conditions adding a fine atmosphere to the conditions. During the day several of the buses made their way out into the surrounding countryside. 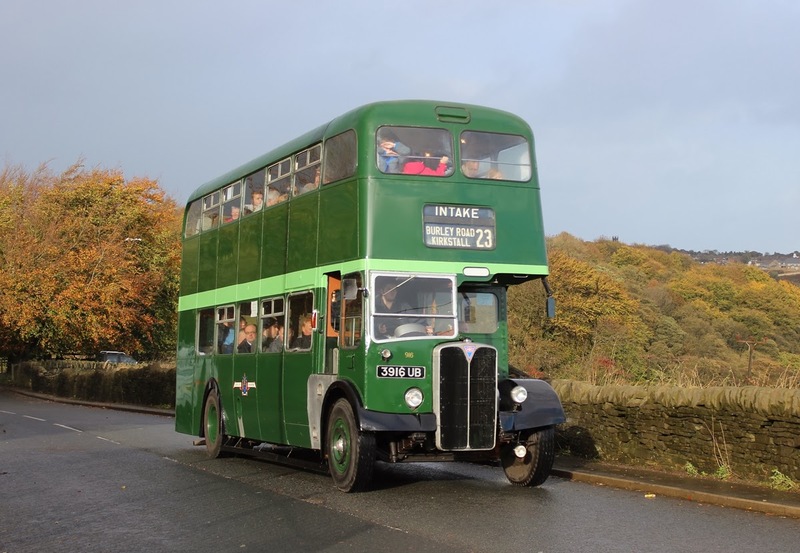 Here one of them Leeds City Transport number 916 an AEC Regent complete with a full complement of passengers trundled its way up into the hills.